Many people aspire to eat light meals that satisfy hunger pangs without creating feelings of fullness. Some may assume light meals must be lacking flavor, but the following recipe for “Silken Chicken” from Madhur Jaffrey’s “Quick & Easy Indian Cooking” (Chronicle Books) is light and packs that familiar flavorful punch that endears Indian cuisine to millions of people across the globe. Preheat the oven to its highest temperature and arrange a shelf in the top third of the oven. Cut 3 diagonal slits across the top of each piece of chicken breast, being careful not to cut all the way through and also not to go to the edge. Prick the chicken pieces with the sharp point of a small knife. Put them in a single layer in a large baking dish and rub both sides with the salt and lemon juice. Leave for 5 minutes. Meanwhile, combine the cream with the garam masala, cayenne, cumin seeds, paprika, garlic, and ginger in a bowl. Stir this mixture well and pour it over the chicken. Rub it into the meat and leave for 10 minutes. Lift the chicken pieces up (most of the marinade will cling to them) and place them down in a single layer in a shallow baking pan lined with aluminum foil. On top of each, sprinkle a little salt, black pepper, garam masala, ground roasted cumin seed, cayenne, dried mint, and lemon juice. Put into the top third of the oven and bake for 15 minutes, or until the chicken is just white all the way through. Serve immediately, minted side up. Place ingredients into a clean coffee or spice grinder and ground to a powder. Put 4 to 5 tablespoons of the whole seeds into a small cast-iron frying pan and set over medium heat. Stir the seeds and roast them over dry heat until they turn a few shades darker and emit a wonderful roasted aroma. Wait for them to cool slightly and then grind them in a clean coffee or spice grinder. Store in a tightly closed jar. Couples expecting their first child often find that the months leading up to the birth of the baby are an exciting time filled with anticipation. But those months are also a time for expectant parents to make some important decisions regarding their finances. Raising a child is an expensive endeavor, one that couples must start preparing for the moment they learn a baby is on the way, if not earlier. Expecting parents likely know their lives are about to change, and those changes must extend to their finances. The following are a few financial pointers for parents-to-be. * Determine your necessary income. Many couples have hypothetical discussions regarding children and their finances, but until they receive the news that a baby is on the way, those conversations have a way of being put on the back burner. Now that a baby is on the way, couples need to revisit those discussions, and determining how much income they need is a great place to start. The dual-income household has become the norm in the 21st century, when the cost of living has skyrocketed. But couples must determine if it’s in the family’s best interest for both parents to keep working once their child is born. The cost of childcare is considerable, and it may be in a family’s best interest for just one parent to work until the child reaches school age. Consider your total income as well as your financial obligations (i.e., mortgage, car payments, etc.) and then shop around for the cost of childcare. If it makes more sense to become a single-income household, even if it’s just for a few years, then you will have another important decision to make. * Determine who is staying home. Couples who have decided that it’s in their best interests to become a single-income household once their child is born must decide who will be staying home and who will continue working. It’s easy to say the parent who is earning the most should continue working, but that decision is not so black and white. Consider the cost of healthcare offered by each of your employers. Some healthcare plans are significantly more affordable than others, and this might weigh heavily on your decision, especially if both parents are earning relatively similar incomes. Another thing to consider is each of your opportunities for advancement at your current company and within your field. Earning potential should factor heavily into the decision as to which parent will continue working, especially if you plan to have another child down the road. The conversation as to who will continue working should be treated delicately. * Discuss your housing needs. Couples who are expecting a child often feel this is a great time to abandon apartment living and buy a home of their own. But chances are you can comfortably manage to live in your apartment for a few more years after your child is born. Those extra years of apartment living can give you the chance to save more money so you can afford a nicer home in a better neighborhood that boasts better schools. Or apartment living for a few more years may give you more time to save and place a larger down payment on your home down the road. The larger the initial down payment, the lower your monthly mortgage payment, so it might be in your best interest to squirrel away a few more dollars before you go house hunting. * Establish a financial safety net. Many financial advisors suggest both singles and couples have between three to six months’ income saved in case of emergency, such as a layoff or an accident that prevents you from working. This is especially important for expecting couples, who will soon have an additional mouth to feed. This safety net should be big enough so you can comfortably pay all of your bills, including those for housing, transportation and food, for three to six months. If saving that amount of money is not realistic, save as much as possible and continue to do so once your child is born. * Purchase life insurance. Life insurance is perhaps the most important purchase expectant couples can make once they learn a baby is on the way. It’s understandable if young couples without children have no life insurance, but that child on the way will be relying on his or her parents for financial support for at least the next 18 years. Life insurance ensures you can provide that support even if something happens to both you and your spouse. The months leading up to the birth of a child is an exciting time for the expecting parents, but it’s also a time to make some important financial decisions. Becoming a parent is a life-changing experience unlike any other. As new parents soon find out, children are expensive, and moms and dads are often eager to find ways to save money without sacrificing the quality of care their kids receive. According to the United States Department of Agriculture, the cost of nurturing a child to age 18, when adjusted for cost of living, has increased by $40,000 since 1960. While the cost of raising a child depends on a wide range of factors, including geography, being a parent in the 21st century requires a more significant financial commitment than it did in decades past. Clothing is a considerable expense for growing families. Children grow out of clothes rather quickly, and parents often find themselves on the hunt for new clothing to accommodate their growing children. Parents can expect to spend in the range of $1,500 to $2,000 per year on children’s clothing, and a 2010 study from researchers at North Dakota State University found that the average American household spends about 3.8 percent of their income on clothing. Cutting clothing costs can be challenging, but it’s not impossible. The following are a few ways to curb spending. * Shop end of season. Take advantage of end-of-season clothing close-outs to replenish wardrobes. Think ahead to what sizes children will be wearing next year and purchase accordingly. 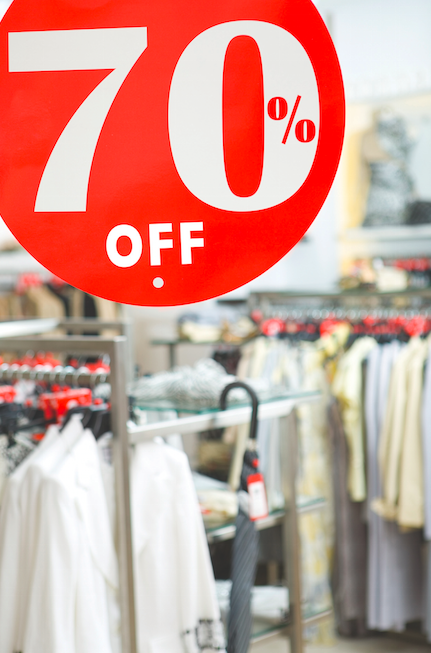 Some stores offer discounts that can be as high as 80 percent off the original price in an effort to clear out last year’s inventory and make room for new arrivals. Use an empty closet or set up storage containers marked with clothing sizes to keep clothing organized. When the kids grow into a new size, you will already have a closet full of new clothes ready to go. * Consider consignment stores. Shopping at consignment and thrift stores can be a great way to supplement a child’s wardrobe without breaking the bank. Consignment shops and donation centers often have extensive inventories, and many items found in such stores are in excellent condition. It’s not uncommon to find popular brand name merchandise and some designer or couture finds at consignment shops. When shopping at donation stores, shoppers are not only finding affordable clothing, but also are helping to give back to the community through their purchases. * Organize a clothing swap. Organizing a clothing swap can be a great way to save money and make friends by getting to know other parents. Chances are there are many other parents looking for ways to cut expenses. Children who grow out of clothing can pass down these items to other people. A clothing exchange is a way to socialize, recycle and save money in the process. * Sign up for customer loyalty programs. In a typical loyalty program, a stores offers discounts to loyal customers. These discounts may include percentages off of everyday purchases or special “private” sale days that aren’t available to the general public. Shoppers also can speak to store employees to find out when retailers traditionally mark down clothing or offer specialized promotions. Establishing a good rapport with store employees can be a great way to learn about upcoming sales before your fellow customers. Clothing expenses for children continue to rise. But cost-conscious parents can corral their clothing expenses in various ways. When hunger pangs arrive and you head to the kitchen to prepare a meal or a snack, it helps to have healthy foods on hand so that you can fill up without filling out your clothes. Sugary or fattening foods may be popular snacks, but consuming too many of these items can cause health implications, including weight gain, that could last for years. Although health experts tout certain “super foods” that are essential for the body, there are run-of-the-mill foods that are far less glamorous but pack their own healthy punch and are much more readily available. When making your next shopping list, be sure to add these items. * Rice: Starchy rice is a versatile food that can accompany many meals. Whether served as a side dish or on its own or with some broth in a soup, rice can help satisfy hunger and keep the stomach feeling full. Brown rice is a healthier option than processed white rice. Rice is also gentle on the stomach for people who need to consume bland diets due to any gastrointestinal ailments. Another advantage to rice is that it stores well and will not go bad, so you can stock up. * Low-fat yogurt: Yogurt can be enjoyed as a snack any time of the day. Rich in calcium and healthy probiotics, yogurt can even replace certain ingredients in recipes, including creams and sour cream. As a dessert, yogurt is a better option than more fattening puddings or ice cream. Thicker varieties of yogurt can help you feel fuller, longer. * Unsalted nuts: An excellent protein-rich snack, nuts can be the go-to food when you need a nutritional pick-me-up. Although they tend to be high in fat, much of the fat content is unsaturated fat that is rich in omega acids necessary for cardiovascular and neurological health. Nuts can be sprinkled on salads or served with cheeses to make meals more satisfying. * Canned or dried fruits: Fruits that are packed in natural fruit juices are just as healthy as fresh produce. However, they can be stored for longer periods of time without spoiling. Many people do not consume the recommended servings of fruit, and having canned or individually packaged fruit cups available makes it easy to include fruit in your diet. Fruits are full of required vitamins and are a natural fiber source to keep digestion in check. Dried fruits can be added to nuts to make a healthy trail mix. Raisins, for example, are a great source of iron, which helps the blood transport oxygen. * Beans and legumes: These foods are high in protein as well as fiber, generally in a low-calorie package. Beans and legumes can replace meats as a protein source in many meals when the goal is to reduce caloric and fat intake. Beans can be used to thicken sauces or make foods more hearty, helping to stretch them further. 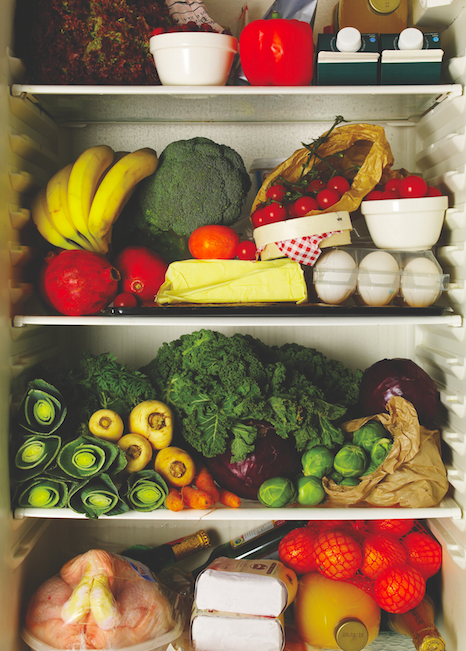 * Vegetables: Whether fresh or frozen, vegetables are a must-have staple. Vegetables are ripe with vitamins and minerals, and pack a lot of punch with very low calories and fat. People need not worry about filling up on vegetables, and they’re one of the snacks that can be eaten in abundance without worry of racking up a lot of calories. Aim to have half of your plate filled with vegetables at every meal, which will keep you full. * Lean protein sources: Fish, poultry and lean cuts of meat are often the basis for meals. They can be kept and enjoyed in moderation. Rich cuts of pork and beef may be flavorful but are high in saturated fats. * Lemons or lemon juice: Rather than seasoning foods with salt and butter, lemon juice is a tasty flavoring that lends itself well to many types of foods. Lemons and limes contain limonene, furocoumarins and vitamin C, all of which help reduce your risk of cancer. * Cranberry juice: In addition to being an antioxidant, 100 percent cranberry juice helps fight bladder infections by preventing harmful bacteria from growing. The juice can be consumed on its own or diluted to add a splash of flavor to water. * Figs: Many people underestimate the nutritional value of figs. Figs can be eaten fresh off of the tree. Think about adding mashed figs to batters for healthier breads or even desserts. A good source of potassium and fiber, figs also contain vitamin B6, which produces mood-boosting serotonin, lowering cholesterol and preventing water retention. 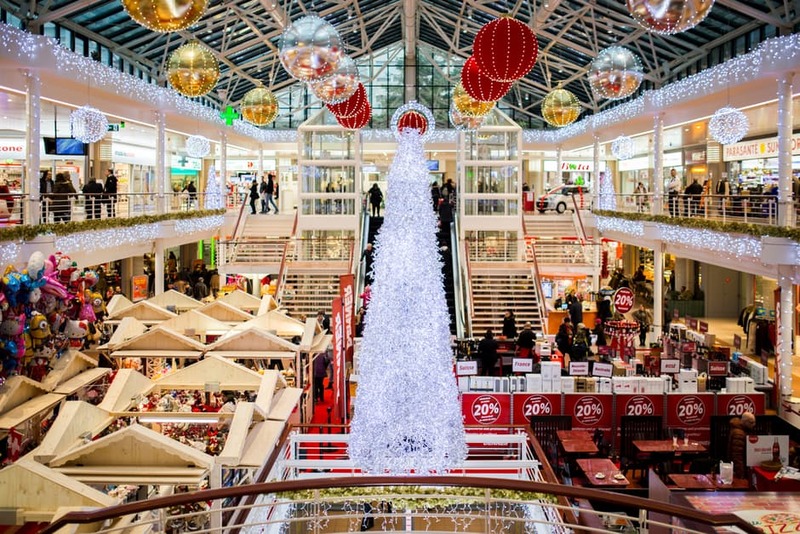 Holiday shopping dominates many people’s free time between the day after Thanksgiving and the final days before Christmas. While many people may shop ’til they drop on Black Friday and Cyber Monday, those days still account for a relatively small amount of the hundreds of billions of dollars that are spent each holiday season. Shoppers now have a bevy of options at their disposal as they embark on holiday shopping season. Traditional in-store retailers are still around, and online shopping continues to grow in popularity with each holiday season. But many holiday shoppers are looking to buy local this holiday season, and such a decision can pay a host of dividends for both shoppers and the communities they call home. · Buying local benefits your local economy. Studies from Civic Economics, an economics and strategics planning firm, found that independent, locally-owned retailers return a far greater percentage of their revenue into their local economies than national chain stores. One such study examined the disparity between revenue recirculation among independent, locally-owned businesses in Raleigh, North Carolina, versus four major national chains in the city. The former recirculated 51.1 percent of revenue into the local economy, while the latter recirculated less than 14 percent. Similar results were discovered in many cities, indicating that buying local not only benefits local business owners, but also the communities those owners and their customers call home. · Buying local creates jobs in your community. One of the biggest ways local business owners in Raleigh recirculated their revenue in the local economy was job creation. While national chains also create jobs, such jobs only benefit your community if the chains are located within your community. If your local mall is a considerable drive away, chances are the chains within that mall are not employing many of your fellow community members. Local businesses in your community are more likely to employ residents of your town. · Shopping local may provide access to more unique gifts. In addition to the economic benefits of buying local, shoppers may find merchandise made by local craftsmen is more unique than mass-produced items found on the shelves of national retailers. 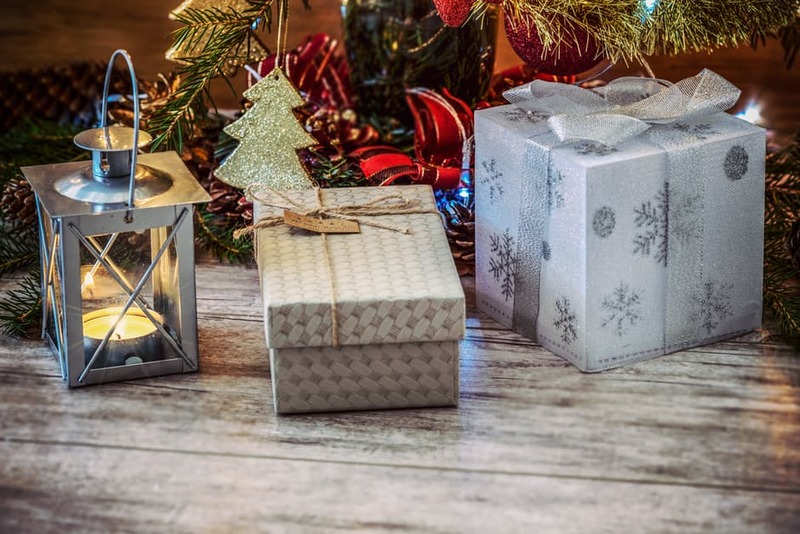 Recipients may cherish more unique items that they cannot find on their own, and that appreciation may even spur them to visit more local retailers after the holiday season has come and gone, benefiting their own communities in so doing. · Local business may provide a more personal touch. Buying from national chains has its advantages, but customer service is not always one of them. Should your loved ones encounter problems with their gift that requires assistance, they might be forced to wait on the phone for extended periods of time as they and thousands of others wait for customer service representatives to answer their calls. Local businesses do not deal with nearly the volume of customers as national retailers and, therefore, are capable of addressing concerns more quickly and personally than large chains. Millions of travelers take to the roads, rails and sky in the days surrounding major holidays. While a large percentage of people travel miles and miles to visit with friends and family members these times of year, others use days off from school and work as prime times for vacations. Holiday excursions can be exciting, but they may require some extra planning and patience. Larger crowds at airports and more cars on the roads can make holiday-timed travel challenging. Make these trips memorable by reducing travel-related stressors. Study your travel options to determine the best way to get from point A to point B. Weigh the cost of your trip as well as the time involved in traveling. 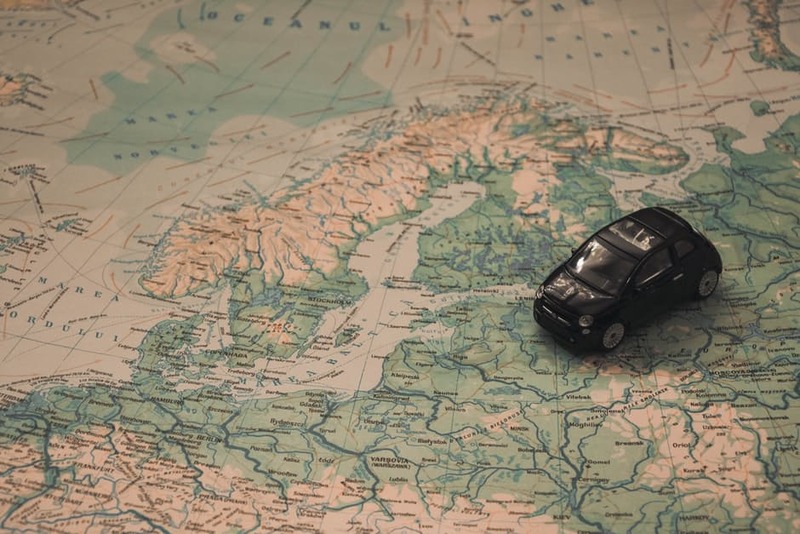 Driving may seem like a good idea if you don’t want to stretch your budget, but it may eat up too much of your vacation time if you’re traveling long distances. If you will be flying, learn the airline baggage restrictions and the security measures in place at your departing airports. This makes navigating the airport that much easier. Planning well in advance also enables you to get the best prices possible. A study by CheapAir.com found that those who booked tickets for domestic travel 49 days prior to departure saved the most money. Even the best laid plans can go awry. Know what to do in the event a particular rest stop or scenic spot along the way is closed or if travel plans get delayed or rerouted. Certain travel apps provide real-time updates on delays or provide gate numbers prior to arriving at the airport. Other apps indicate which gas stations have the lowest prices or which rest stops offer the cleanest bathrooms. Drivers should make sure their vehicles are in good working condition prior to departure. More cars are on the roads during holidays, and that means a greater potential for stop-and-go traffic, which can put added stress on the vehicle. Make sure your tires are properly inflated and in good condition to avoid flats or blowouts, which can delay your trip. Ship gifts or keepsakes ahead of time so you do not have much to lug through airport terminals or rail stations. If you must take gifts with you, wait until you arrive at your destination before wrapping them, as this makes items easier to inspect. If you’re going on vacation instead of just a weekend getaway, you will probably return home with more items than you brought because of gifts or souvenirs. Pack an extra tote bag or an empty carry-on suitcase where you can store extra items accumulated on the trip. Otherwise, see if these things can be shipped home. It may be cheaper to ship items than to pay airline baggage fees. It’s often quicker and less stressful to travel during off-peak hours when roads and airports are less crowded. Off-peak hours include overnight, early morning or late evening. Red-eye flights or off-peak travel times also may be less expensive. Travelers looking to avoid crowded roadways or airports may also want to avoid especially popular travel days, such as the Wednesday before Thanksgiving. Leave a few days before a major holiday or arrive a few days after to avoid the crowds. Failure to eat or drink can do more than lead to hunger pangs and dehydration. It can make the body sluggish and may affect your ability to deal with minor (or major) irritations. Pack nutritious snacks and take breaks to refuel your body. Statistics indicate the average Thanksgiving dinner exceeds 3,000 calories. That is more calories than a person should eat in an entire day, much less a single meal. Many people admit to indulging on bigger portions and more fattening foods come the holiday season, but choosing some lighter fare this Thanksgiving can make the meal healthier without sacrificing taste. 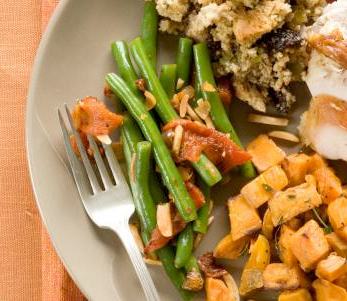 Although there are staples of Thanksgiving dinner, many low-calorie foods can be included to make the meal healthier. The following are a few healthy substitutions or alterations holiday hosts can make when preparing their Thanksgiving feasts. * Trim down the turkey. Play up the main course with aromatic seasonings or unexpected flavors. Use garlic, olive oil and basil to add a boost of flavor to turkey without having to rely on butter or salt. Marinate the bird with lemon juice and citrus marmalade for a sweet, yet pungent flavor. Consider omitting the bread stuffing and making a stew of roasted root vegetables instead. * Opt for turkey breast. White meat of a turkey tends to have less fat and calories than the darker cuts. Serve turkey breasts only, which will not only cut down on calories, but also on the amount of time needed to cook the meal. * Make homemade cranberry sauce. Taking the time to make your own cranberry sauce means you can control the ingredients. Cut down on the amount of sugar used in the recipe or substitute it with honey or molasses. * Reduce the number of courses. Thanksgiving dinner often features multiple courses. Extra courses can be expensive, but such massive spreads also lead many people to overeat. Stick to two or three courses, and chances are guests will not miss the extra food. * Choose whole-grain breads. Sliced whole-grain breads or rolls paired with an olive tapenade will be flavorful and such breads are healthier than white bread and butter. * Flavor vegetables with herbs. Vegetables grilled or sauteed with fresh herbs may be so flavorful they will not need added dressings that tend to be rich or cream- or butter-based. Have a wide variety of vegetable side dishes available so guests can fill up on healthier fare rather than more calorie-dense items. * Serve only low- or no-calorie drinks. Beverages can add a substantial amount of calories to Thanksgiving meals. Give guests the option of sparkling water or even diluted cider so they’re not filling up on sugary sodas or other high-calorie beverages. * Serve fresh fruit for dessert. Create a fresh fruit salad that can be served in lieu of fatty cakes and pastries. * Include other activities. Do not make the meal the centerpiece of the celebration. Plan activities, such as a game of football in the yard or a walk around the neighborhood. This places a smaller emphasis on eating while giving guests the opportunity to burn off some of their meal. No matter where you look, screens are everywhere. The proliferation of easily portable tablets and smartphones means many people, adults and children alike, are never too far from the nearest screen. 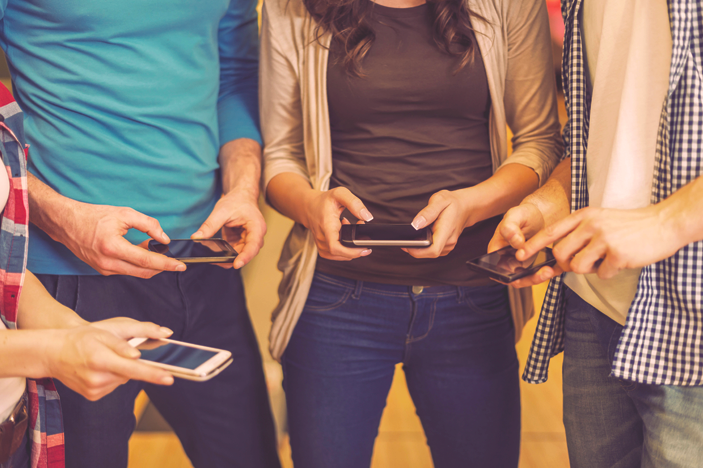 While that accessibility has dramatically changed the way many people live their lives, excessive exposure to screen time can produce a host of unwanted side effects. Steven Gortmaker, a professor of the practice of health sociology at the Harvard T.H. Chan School of Public Health, has studied the negative effects of excessive screen time on children since the 1980s. According to Gortmaker, such effects include higher rates of obesity among kids who watch too much television and difficulty sleeping among youngsters with access to small screens, such as the screens of smartphones. In addition, a 2012 study published in the journal Psychiatry Research linked screen time with impaired cognitive function in young males. But adults are not immune to the effects of excessive screen time, either. Spending significant time being sedentary and staring at screens can increase adults’ risk for cardiovascular disease. An Australian study published in the December 2012 issue of the British Journal of Sports Medicine found that, compared with persons who watch no television, those who spend a lifetime average of six hours per day watching television can expect to live 4.8 fewer years. So what can families do to cut back on their screen time? While it likely won’t be easy to put down smartphones and tablets and turn off laptops and televisions, the following are a handful of ways for families to spend less time staring at screens. · Remove televisions from bedrooms. Parents may find it impossible to gauge, much less control, how much time their kids spend watching television when youngsters have TV’s in their bedrooms. Though this will likely be met with considerable resistance, remove televisions from bedrooms in your home. Set a positive example for kids by removing your own bedroom television as well. Come kids’ bedtimes, make sure all devices, including smartphones and tablets, are left in common areas of the home rather than bedrooms so kids are not tempted to watch videos instead of falling asleep. · Institute a “no screens” rule during meals. Many parents grew up in households that did not allow televisions to be on during meals, and while the times might have changed with respect to the technology, similar rules can still prevail today. A “no screens” rule during meals gives parents and their kids time to catch up, bond and foster stronger relationships. · Do not use the television for background noise. Turn the television off when it’s serving as just background noise. If you need background noise, turn on some music instead. · Log screen time. Logging screen time for each member of the family can provide an estimate of just how much time the whole family spends staring at screens. Encourage each member of the family to spend as much time being physically active as he or she spends staring at screens. Set goals for each member of the family to reduce their screen time, even rewarding those who reach their goals. Many families anticipate holiday gatherings for months. Such gatherings bring together friends and family members who may not see one another much throughout the year. Food tends to be plentiful at holiday gatherings, so it should come as no surprise that the holiday season generates a good deal of waste. In addition, energy consumption is high during the holiday season. The United States Environmental Protection Agency says household waste generally increases by 25 percent between Thanksgiving and New Year’s Day – equalling about 1 million extra tons of waste. The Worldwatch Institute states that the same period of time generates three times as much food waste as other times of the year. Making the holiday season more sustainable does not mean families must give up their cherished traditions. Here are several tips to help make your holiday celebrations a bit more eco-friendly. · Cut down on packaging. When shopping, seek items that are minimally packaged or shop at retailers that offer package-free products. Packaging accounts for a considerable portion of the trash that ends up in landfills. Shopping at local stores and craft fairs can help you avoid too much plastic packaging. · Decorate with efficient products. Making a home look festive is part of many families’ holiday celebrations. Opt for LED holiday lights, which last longer and use a fraction of the energy of traditional lights. Use soy or beeswax candles and incorporate as many natural items, such as fresh evergreen boughs, branches and berries, as you can find in your decorations. · Shop smart. Shop at food stores that stock local products so foods do not have to travel great distances to reach your table. Take advantage of local farm stands and other vendors that pop up in the autumn. 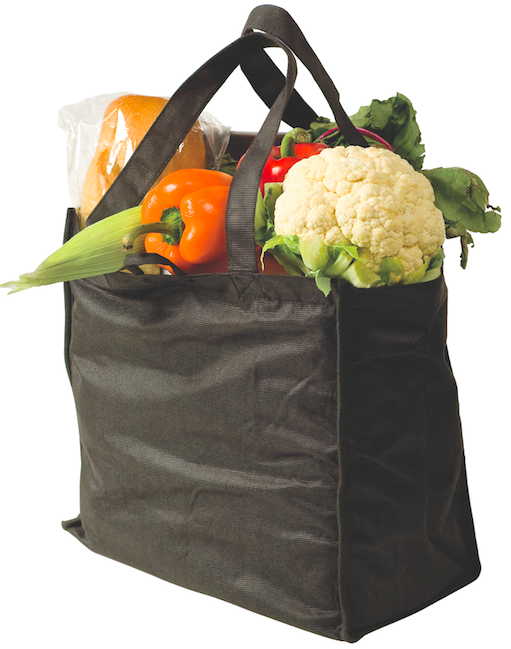 Remember to bring reusable shopping bags with you on any shopping excursions so you can reduce your reliance on paper and plastic bags. · Reduce food waste. People often cook extra food for the holidays out of fear of not having enough for guests. But leftovers often end up going to waste. Use planners to determine how much food to cook for the number of guests you will be having. 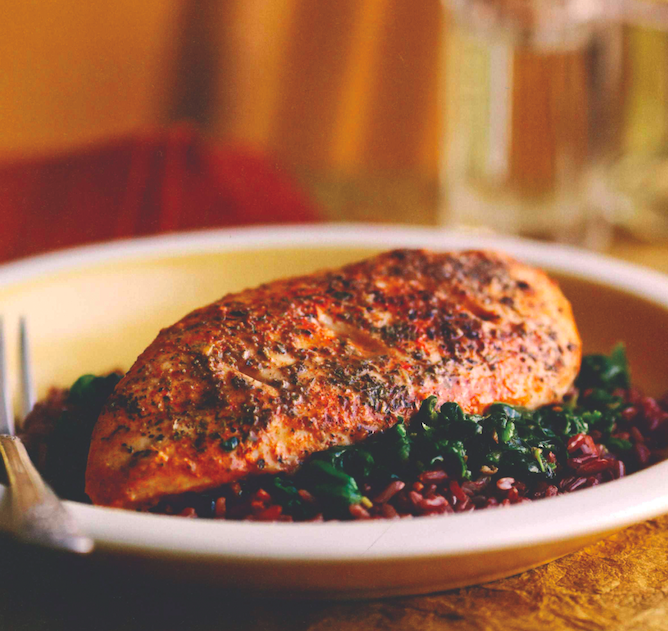 Keep portion sizes healthy by selecting smaller dinner plates and providing foods that are hearty and will fill guests quickly, such as rich proteins and complex carbohydrates. When the meal is done, promptly wrap up leftovers so they don’t spoil. · Use reusable dishes. Avoid paper and plastic dishes, instead opting for ones that can be used again and again. Take out your fine china or a festively patterned service set to use. Keep the dishwasher empty so that you can load it up with dirty dishes and run a full load to save even more energy.